When little children want you to know something belongs to them…they let you know. A scribbled name on the foot of a toy. A warm, slobbery tongue on the top of a Coke can. A proud, but not too harshly spoken, "Mine!" Milda was no different. If you were friend or family of Milda you knew it. She wouldn't let you forget how much she loved you. She may not have scribbled her name on your foot, but she wouldn't forget to send a card on your birthday or just to say hello and God Bless. She may not have slobbered on your forehead to claim you, but she wouldn't let you leave without a warm hug and friendly kiss. Yes, Milda loved. Milda was compassionate. Milda was kind and caring. She all of these things and more. But her love was not her own, it was Christ's love. Her compassion, kindness and caring were not her own, but Christ's kindness and compassion. The real reason that Milda has made such an unforgettable mark on all of our lives is because of the mark that she was given by her dear Lord and Good Shepherd, Jesus Christ. And this is the most important mark of all – the sign of the Cross given to her in Baptism. For this is no ordinary sign, just as the cross of Christ is no ordinary cross. In Holy Baptism Milda was clothed with the robe of righteousness that covered all her sin. That's the real reason Milda was full of compassion and joy and love because her Good Shepherd had rescued her from sin, death and the devil. She who is forgiven much also loves much. Milda knew she was a sinner. But she also knew she was a saint. Her sin was great, but she knew Jesus her Savior is far greater, even than her sin. She knew the voice of her Good Shepherd – that's why her well-read Bible next to her bed always had a bookmark tucked in the pages of the Psalms. The Psalms were Milda's prayers. They're our prayers; but they're also Jesus' prayers. In the Psalms we hear the voice of the Good Shepherd just as Milda did. The Lord is Milda's Shepherd; He is your Shepherd. There is no want. What else could you want? Who else could you need? Of course that doesn't stop us from trying. For we, like Milda, are also sinners. That was her confession. It is also our confession: If you, O Lord, should mark iniquities; O Lord, who could stand? We, like Milda, need a Shepherd. Milda knew her Good Shepherd. She trusted in His mercy. Milda wore her faith in Christ on her lips. And just like her love and compassion her faith is not her own, it is a gift, a Mark made by the Good Shepherd. And greater love has no one than this, that the Good Shepherd lay down His life for the sheep. That we might lie down in green pastures; He laid His body in the tomb. That we might rest beside still waters, He thirsted upon the cross suffering only to drink the Father's wrath against our sin. That He might restore your soul, He gave up His spirit. That He might lead you in paths of righteousness the Good Shepherd walked the agonizing, suffering road to Golgotha. For the sheep the Lamb was slaughtered. For you who live in the valley of the shadow of death, He walked the road ahead of you into death. That you might dwell in the House of the Lord forever. The Lord is my Shepherd, Milda's Good Shepherd, your Good Shepherd. And in this way, with water and word He marked Milda in Holy Baptism. He clothed her with His righteous life and death and resurrection. In the Name of the Father and of the Son and of the Holy Spirit, Jesus declared a big, forever "Mine" on Milda's life. That's the Shepherd's Mark of baptism: a simple sign of the cross; some plain ole' ordinary tap water and a divine flood of forgiveness. Washed and made white in the blood of the Lamb. This Good Shepherd declares: "Fear not, Milda, I have redeemed you; I have called you by name; you are mine. Fear not, you who mourn and weep today – my death is your death; my life is your life. Trust in Me." Christ is not dead. He is living. And because He lives, so does Milda, and so do all who believe in Him. When God wants you to know that someone belongs to Him…He lets you know. He declares His forgiveness to you this day. His Son has borne the marks of your iniquities with every stripe plowed into His flesh. Jesus died so that where He goes you may go also: Baptized? Jesus is there. Suffering? Jesus is there. Life and death? Jesus is there for you. "I AM the Good Shepherd, the sheep hear my voice and He calls His own sheep by Name," His Name. You are His – through His word and promise. You are His –soaked and sopping wet with forgiveness. Marked in baptism. You are His – scribbled with blood in the Lamb's book of life. One day I told all of this to Milda, to which she replied, "Well, He just marks us all over doesn't He?!" Yes, he does. Lays down His life. Marks us with His cross. And He calls Milda, and all of you His own. "The aluminum pint from Miller has a wide mouth, a resealable cap and four more ounces of that great pilsner taste you love. And when you love something, you want more, not less. Nobody wants less bang for their buck. Less power to you, good, more for me. The less the merrier, maybe if you life in loser town. Say no less, I mean it, stop saying less. So why settle for less when you can have more? The Aluminum Pint from Miller. Tastes Greatness. Miller Brewing Company, Milwaukee, WI. Great Beer, Great Responsibility." No, I'm not being paid by Miller. 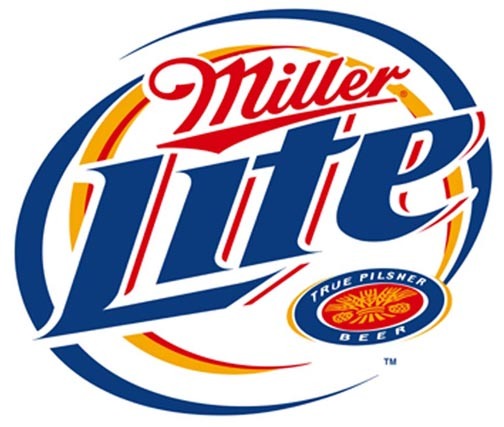 And for the record, the only good thing about Miller happens to be their occasionally-clever, but not always funny commercials. All Monty Python jokes about American beer aside, the content of this particular radio commercial is great, unlike the water their trying to pass off as beer. Why is this commercial so great? Trust me, it's not about that great pilsner taste. And it's not about some new seeker-sensitive outreach model trying to fist pump the Gospel into local frat-houses by means of Miller-vangelism. Let the reader understand, good beer and Lutheran theology are as inseparable as Eutychian Christology of the two natures of Christ (and if you didn't have to look that up you are a nerd). But seriously, the Reformation would be nowhere without the soothing flow of hops down Luther's esophagus and the flow of 200 proof theology God proclaimed through his lips from the classroom to the bar (remember the White Horse Inn). And now for something completely different; this post really isn't about the beer. It's all about some thoughts concerning weekly communion using, yes as ironic as it may seem, a commercial for cheap, some might even say unholy, beer. I've been reading Kenneth Wieting's discourse on this topic (weekly communion that is) entitled, The Blessings of Weekly Communion. It's a great book, but this is not a book review, just a few thoughts on weekly communion after hearing this radio commercial. "When you love something you want more, not less." Amen! Our old sinful nature seeks the love of all good things in God's green earth by twisting turning and navel-gazing every good gift from our heavenly Father into an idol. You see our old sinful nature always wants more - more sin, more me, more death. And if we then, who are evil according to our sinful nature recognize that more is better, how much greater then, will our new nature (baptized and forgiven and sanctified in Christ Crucified) rejoice in loving and receiving and wanting more of our Lord's good gifts. And how much greater still does our Lord Jesus Christ delight in dishing out His gifts in the Lord's Supper. Welcome to the table of the Lord; it's the best restaurant in town with the best menu bar none. Here at the Lord's Table Jesus Christ is Himself the cook, waiter host and meal. He's the appetizer and the main course. 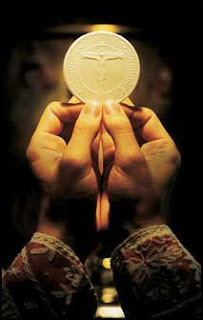 This precious chalice from our Lord Jesus Christ has a wide mouth, and an unlimited cask of that great blooded-for-you forgiveness you need and love. And when you love something you want more, not less. Nobody wants less Jesus and more sin. Less Jesus for you is good more no one. The less the merrier, maybe if you live in Phariseeville. Say no less, I mean it; stop saying less. So why settle for less Jesus when you can have more and more and more of His all-availing medicine of immortality every Sunday? Welcome to the Table of the Lord. Taste forgiveness. Brought to you by our Lord Jesus Christ and His gifts given in The Divine Service, AnyLutheran Church, Anytownville, America. Great chalice. Great forgiveness. "Grace Mercy and Peace to you from God our Father and from our Lord and Savior Jesus Christ + Amen. When it comes down to it there are only 2 kinds of people in the world: those who would seek to enter the narrow door by their prayers and wrestlings, by their piety and self-justification, by their works and sacrifices– you know, there's no such thing as a free lunch even in heaven. And those who know they are not able to enter the narrow door by their works, and sit at the banquet table by invitation, and not by merit. "Lord will those who are saved be few?" Good question, but it's not ours to answer. The better question is which kind of person are you? Are you the self-righteous or the declared righteous? Truth be told, you are both: justifier of self and justified by Christ; sinner and saint; both knocking on heaven's door by your own merits and despairing of your sin trusting in Christ. Yes, there are only two kinds of people in the world because there are only 2 religions in the world: Free and Not Free. Don't let the religious experts fool you. "All doors lead to heaven; we all worship the same god just in different ways." The gate is wide and the way is easy that leads to destruction. There are not many ways to heaven but one: I am the Way the Truth and the Life no one comes to the Father except through the perfect life and death of the Narrow Door. How insensitive of Jesus, how politically incorrect, how intolerant. "Strive to enter by the Narrow Door. For many I tell you, will seek to enter and not be able." Many have tried to throw a ladder over the door and climb the stairway to heaven. Many have painstakingly crawled for a way across the threshold with their calloused hands and knees. Many have groped the walls and framing through the darkness of their feelings and emotions. The tower of Babel was tall, it was not tall enough. The Pharisees had the Law but used it as a ladder instead of a sword. They hosanna-ed His miracles but hated His Word. They rejected His Way for their own. There is no other way, no other Name, no other Door, no other Savior. Don't try it. Don't flirt with it. It's pointless and only leads to pride or despair. There is a way which seemeth right unto man, but it leads to death. This is the way of our old Adam - a proud, card-carrying Pharisee. "I know I'm in, but look at all these losers. I'm surrounded by sinners. Thank God I'm not as bad as them. Thank God I'm not like those people who don't show up on Sunday. At least I'm here. I've done my part. I've given my tithes. Attended Bible study. I know the catechism perfectly. I know the Gospel, don't tell me I'm a sinner. I've strived and wrestled. Repent. Busy hands are also the devil's playground. God is not pleased with your works of self-righteous, un-justification. When Jesus speaks about his return at the end of time He did not say, When the Son of Man returns will He find a growing and successful, striving-to-enter-the-narrow-door-by-their-own efforts church? But, when the Son of Man returns will He find faith on the earth? Behold, days are coming declares the Lord when the door will be closed as it was in the days of Noah. And when once the Master of the house has risen and shut the door, and you begin to stand outside and knock at the door saying, "Lord, open to us," he will answer you, "I do not know you and where you are from." Then you will begin to say, "We ate and drank in your presence, and you taught in our streets." But he will say, "I tell you, I do not know where you come from. Depart from me you workers of unrighteousness." Who are the ones standing outside knocking at the door that will never be opened? Those who would seek to enter the Narrow Door by their own works; those who would be justified according to thought, word and deed. And if that's how you're going to try and get through the narrow door, then it's already closed. Repent, for we who desire to be first really are last. O, Lord, who then can be saved? Who can enter the narrow door? Can a few? No, not a few, but One. Jesus: King of kings, Lord of lords and Door of doors. The shape of this Narrow Door is the corpus of Christ the Crucified. Jesus is, the perfect, sinless, holy, righteous Narrow Door. He opens the door and drags you in kicking and screaming all filthy and covered in the stench of sin and He cleanses you, and sits you down to recline at His heavenly banquet table where He feeds you. In this way He saves you. For you cannot, by definition, save yourself. If you could, you wouldn't need to be saved. He does for you what you cannot and will not do on your own. He strives. He enters. As the Father loves Him from all eternity, so He loves you with all of His heart and all of His soul and all His mind in thought, word and deed. This is why His face is set towards the Holy City for unholy sinners. He takes your unrighteousness upon Himself so that He might cover you with His righteousness. He enters the gates of Jerusalem for all who live outside the gates of Eden. This is why Christianity is not just one of 31 religious flavors of the week. It's the one religion where you don't do anything to earn, buy, work or pay your way in. The death of Jesus is good enough. Blood shed enough for you. Pierced for you. Crucified for you. It is finished for you. Jesus the Narrow Door now open for you. Through the Baptismal stream of ever-flowing blood and water you are drowned into the Kingdom of God. Through His Word of absolution the mustard seed is sown and the Kingdom of God takes root in you. Through His Supper you dine with Abraham and Isaac and Jacob and all the company of heaven in the Kingdom of God. Will only a few be saved? No, not a few, but many. For the Narrow Door is wide enough to embrace a world hell-bent on striving and seeking its own way into heaven. A sinful world squeezed through the doorway of one perfect life, death and resurrection. Just as one man, Adam dragged all of humanity into eternal death and condemnation, so one man, Jesus, pulls all humanity into His own forgiveness, life and salvation by His cross and tomb. From the heights of heaven to the lowliness of the cross the first was made last. The Father shut the door on His cursed Son, left for dead all to open heaven's joy for you. The tomb was sealed and your sin, all your self-righteous works of un-justification were buried with Him. He closes the lid, piles the dirt and buries Himself in your death, sins and all. Crucified. Dead. Buried. But Death's door could not hold Him. He is risen. He has swallowed your sin. Digested your damnation. Devoured your death. Slammed the door of death and hell shut with a resounding Alleluia. And He ascended to the highest heaven to bring you, the greatest sinner, through the narrow door of His death and life. "Fear not, I am the First and the Last, the Living One. I died and behold I am alive forevermore, and I have the keys to Death and Hades." Will only a few be saved? No, not a few, but many, a great multitude that no one can number from every nation, tribe, people and language from East, West, North and South. This narrow but open door is wide enough for the worst of sinners, chief of sinners, yes even you. For you who were last have become first because He who was first became last. Dirty Jobs: that's the name of a popular television show on the Discovery Channel. And as the title suggests, the host, Mike Rowe, gets messy, dirty, and downright filthy as he searches the country side "looking for people who aren't afraid to get dirty (Discovery Channel – 2008)." From dirty jobs such as Roadkill Collector and Sewer Inspector to Whale Autopsy Technician and Septic Tank Specialist, Mike Rowe explores the livelihood of "hard working men and women who earn an honest living doing the kinds of jobs that make civilized life possible for the rest of us (Discovery Channel – 2008)." Dirty Jobs is a sublime illustration of the Christian doctrine of vocation in action. When we speak of vocation we usually think of our "job" or specific vocational training that was earned at a vocational school. But the biblical teaching of vocation involves more than thanksgiving for a "job"; it recognizes that God is the giver of all good things and He calls us into particular offices in life so that we are able to provide daily bread for our families and to serve the neighbor and in doing so, we also serve our Heavenly Father. Vocation is a Christian word. It comes from the Latin word vocare, or calling. All Christians are called. 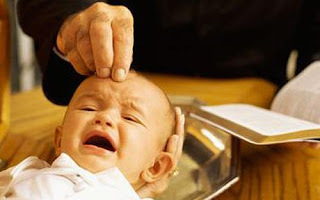 Your calling began when you were baptized in the Name of the Father and of the Son and of the Holy Spirit. Through baptism, all Christians are called by God to be His children, buried with Christ in His death and rising with Him in His resurrection. This is why St. Peter calls Christians a royal priesthood and a holy nation (1 Peter 2:9-10). And according to God's Word in St. in Romans 12:1 we are to present our bodies as living sacrifices. There is a temptation, then, to think that by these living sacrifices – whether it is our vocation at church or at home or at our workplace – we earn favor with God. God doesn't need our good works. In fact, He has already done the best work for you, in Christ's perfect life, death and resurrection. Our calling into faith and life in Jesus our Savior is a free gift. So, even though God doesn't need our good works, our neighbor does. This is why our earthly vocations or "stations in life" as Luther called them are fruits of our heavenly calling as God's children in baptism. The purpose of vocation is to love and serve the neighbor in the particular stations in life that God has called us to whether we are a husband, wife, father, mother, son, daughter, teacher, student, etc. We don't live life hidden in a corner. This was the danger of many priests and monks in the Reformation era. Many taught that the highest form of Christian living was to become a monk and live in a monastery. Luther wrote extensively against this false teaching as he re-discovered the doctrine of vocation and began to teach and preach about its necessity in the Christian life. Luther taught that on one level, there is no difference between monk and magistrate or priest and plumber. Each Christian is called according to God's Word and Spirit, regardless of what their status in society is. This means that God's calling of a Roadkill Collector is just as holy as God's calling to be a pastor. The difference is the office and duties that are unique to each vocation. For example, the pastoral office is not the office of school teacher, just as the office of father is not the same as the office of mother. Each vocation, or calling from God, has particular and unique duties attached to it. This is how God works in, with, and under the ordinary means of this life to accomplish His good and gracious will, physically and spiritually. Luther called vocation the "mask of God" where God hides Himself so that through the work He has called us to do, the needs of people in our family, workplace, and society might be cared for in love and mercy. Therefore, we can find joy in what appear to be mundane activities – from scrubbing toilets to inspecting sewers. Through our vocation God has called us to serve Him as we serve the neighbor. Luther once said that we can find God, even in the sewer. While this may seem odd, it is true in many ways. We can thank God for the vocation of sewer inspectors and other jobs like them that keep our homes safe and clean. But what is even more joyous is the fact that through the incarnation of Christ into human flesh – God has come to us in our sewer of sin. There was no job too dirty for Jesus. There was no sin too ugly, too disgusting, and too condemning that would keep His love from us. And so He got into the mud and muck of humanity by becoming one of us, by dying for us and rising again from the dead. Now that was a dirty job. He who knew no sin was made sin for us so that we might be washed clean in the water and the blood that flows from His pierced side. That was Jesus' calling and therefore you are called His dear children – no longer dirty but clean, free, and forgiven. God Bless you in all of your dirty jobs that He has called you to in this life. And enjoy getting dirty! God at Work: Your Christian Vocation in All of Life – Gene E. Veith, Crossway Books, 2002. Luther on Vocation – Gustaf Wingren, reprinted by Wipf and Stock Publishing, 2004. Wait, what? That's a Christmas hymn…but it's August? Yes, that's right. Christmas in August. If every Sunday is a little Easter then it's also a little Christmas. Just as Jesus was Crucified under Pontius Pilate He was also born of the Virgin Mary. She is the God-bearer. The Mother of God. Most blessed among women. And there you have centuries of controversy in just a few sentences. There's no place for Mary-phobia. For the blessedness of Mary is not really found with Mary, but in Mary. Her honor is given and bestowed by the One she bears. For He is born flesh of her flesh and bone of her bone. She is the new and greater Ark of the Covenant bearing in her flesh the Word made flesh. Her bulging belly is the new Holy of Holies. The honor of Mary is the mercy of the Lord. And blessed is the fruit of her womb. Mary had a little Lamb, Emmanuel – God-with-us. God-one-of-us. God-for-us. God uses Mary with her weakness and piety, shame and honor, to strengthen our faith; to show His compassion for the lowly. And so we honor Mary today not because of who she is on her own merits. But because of her calling – Mother of God and by her being called to faith by the One who took up 9 month residence in her womb. In Christ, Mary is blessed and so are you. This is how God works. Creating something out of nothing. Doing the impossible with the improbable. From the void of creation to the nothingness of Mary's womb. From the fullness of creation to the fullness of the deity, pleased to dwell in our human skin and bones, to breath our poisoned air and enter our hall of death. What seems to us like a miracle is all in a day's work for the Lord. This is how God works. For the foolishness of God is wiser than men and the weakness of God is stronger than men. Indeed it is. He chose a lowly, unwed, virgin to bear a child. Teen Mom or 16 and Pregnant did not air on MTV in Bethlehem. That kind of thing got you stoned. Honor? She was taken for an adulterer. Blessed? She had to be cursed. But that's not how God saw it. God chose what is foolish, what is weak, what was low and despised in the world to shame the wise and strong. To break what is whole and make whole what is broken. So it was with the Promise Seed through aged Abraham and Sarah. So it was with broken Elijah in the cave. So it was with stuttering Moses. Sheep-breeder turned prophet Amos. Adultery committing David and poor, peasant Mary. God honors her. Therefore so do we. And her honor is this; she witnesses the fullness of time in her own womb and her redemption in that fleshly, miracle. Miracles upon miracles…that the Angel Gabriel came to Mary with the message declaring she would be the God-bearer - miraculous. The message Gabriel preached – that God would save a world hell-bent on destroying itself – miraculous. That God would send His own Son to be born and later killed at the hands of sinful rebels for the lives of sinful, disobedient children – miraculous. That Elizabeth recognized Mary's precious cargo and John leaped for joy in her womb – miraculous. But the greatest miracle of all is that Mary actually believed it. This is the miracle of God's Word, doing what He does best – creating something out of nothing. This is the miracle of faith. Pure gift. For into the nothingness of her womb, this lowly, poor, outcast virgin from the distant lineage of David becomes the mother of our Lord. All in a day's Word for our Lord. She sings…my soul magnifies the Lord and my spirit rejoices in God my Savior because He has regarded the low estate of his servant. If the Magnificat were an English composition God would be the one running all the verbs, not Mary. She sings about the Mighty One. For He does great things. He does Passover things. He does exodus things. He does sacrificial lamb things. He does rescuing from death and hell things. All by the power of His right arm…which at the very moment of Mary's song is the size of a matchstick. This is the blessed paradox in Mary's song: Mary rejoices in God the Father Almighty and yet she is also praising the helpless unborn child in her womb. She praises the Creator of heaven and earth even as He is growing and twisting and kicking inside of her. She praises the God who comes with chubby little feet bearing the Good News, the God who is the help and Savior of the world and yet is helpless at His mother's breast. The God who came as 8 pound 6 ounce little baby Jesus. She praises those infant arms –as we do – for it is those righteous arms upon which all of human history will hang, all of human sin and calamity, all of the devil's temptations – even God's wrath itself will be poured out on His own Son. In doing so, Isaac steps off the altar so that Jesus can lie down on it, for Mary…for you. How could she not sing? How could she not help but praise the Lord? Singing is the voice of faith. And Mary is not alone in her song. What she received you receive. What she sang you sing. The Word made flesh dwells among you. He is bone of your bone and flesh of your flesh. You are also His miracle. You – sinner are now called saint. Into the emptiness of your cold, wicked sinful condition God comes bearing new life by His Word. He speaks a new creation into the briar-patch of your heart. He pours living the water of Baptism over you, re-genesising the desert of your sinful nature into a fountain of life. He creates faith in you out of nothing. He makes all things new. And He swaddles His own flesh in bread and pours out His sacred blood in the manger of your mouth. And this is why we sing with Mary, for He has regarded our low estate, our sinful state, our good-as-dead state. He has done great things for you though you have done nothing but great things against Him. You who deserve nothing good are given every good in Him. Jesus goes where we deserved that we may receive everything that we do not deserve. A great reversal. God gets all of your sin and you get all of His righteousness. Jesus takes your death and you get His life. Christ is powerless on the cross; and yet there He performs His mightiest work. Conquered sin. Died our death. Suffered our hell. The Seed of Eve crushed the serpent's head. A terrible and wonderful sacrifice. The Lamb of God whose fleece was white as snow, became reddened to take away the sin of the world. And what is there to do but join Mary in song. We sing with her of this joyous catastrophe as Jesus fills our hungry souls with good things…with the best things, Himself. In this way, Mary is called blessed and God gets all the credit. She is honored because she heard the Word of God, and impossible as it was, believed it. That's the way God works for you as well. God does it all, impossible though it may seem. Through Jesus' sacrifice Mary is blessed and so are you. All in a Sunday's Work. Some people say a wedding – like anything you do in life – is all about what you put into it. And from the looks of this evening, a lot of love and care has been poured into this wedding. We have a beautiful bride and a handsome groom and a picturesque view. You have caring, compassionate mothers and good friends who are more like family. Not to mention the smashing good time that you all had at the rehearsal dinner last night. Yes, a lot has been put into this wedding and that's important. But…do you know the last part of that poem? And a silver sixpence in her shoe. Yes, what you put into your wedding day is important. What you put into your daily lives from this day forward is even more important – love, compassion, sacrifice, honor, vows. As important as these things are, they are not the ultimate important. In fact, what we see today is not nearly important as what we do not see. You see, if marriage is really only about what we put into it, then we are more alone than Adam was in the beginning. Today, we witness Jon and Danyelle making vows to each other, sacred vows; vows that bind and unite them as one flesh. But vows that grow harder and harder to love and cherish with each new day. Vows that will come under attack from the world around you, the devil's temptations and even your own sin. Days will come when Jon will not be as loving as he promises to be here today. And days will come when Danyelle will think that following her husband is the most foolish thing in the world. Days will come when words like - "sickness and health" or "richer and poorer" – will seem like an impossibility. Today it's not so much that Jon and Danyelle are marrying each other, as it is Christ uniting them as husband and wife by His Word and promise. He is the One uniting you as one flesh. He is the One who binds you together – for two are better than one…and two united by Christ are an inseparable 3-fold cord, not quickly broken. He is the One doing for you all the things you promise but cannot do on your own. It's not your love that sustains your marriage, but your marriage that sustains your love. 2 are better than 1. God formed Adam from the dust of the ground. But it was not good for Adam to be alone without a helper, without a companion. And that is why it is not good for Jon or Danyelle to be alone. Just as God provided for Adam. He built Eve out of flesh and bone and united them together in that first marriage. And man's first recorded words are words of pure joy: "this at last is bone of my bone and flesh of my flesh." Adam rejoiced because Eve was different, but the same, a perfect compliment and companion. So too, He provides for you. 2 are better than 1. It's not good for man to be alone. Jon, behold your Eve. She is flesh of your flesh and bone of your bone. She is different but the same, a perfect compliment and companion for you. A gift from God for you. And greater love has no husband than this – that he lay down his life – and live each day – for his wife. For life without her would be as ridiculous as a head without a body. This is the love you are called to share with Danyelle in wedded love and faithfulness. And Danyelle, this is the love which you receive and give in return. Danyelle, behold your Adam. He is the husband God has gifted you. He is the head to your body. And you need not cringe at the S-word, submit. For to submit to him is to submit to his sacrifice and love and compassion for you. This is God's gift of love in marriage. 2 are better than 1…but 2 united by Christ are best of all. Although neither of you will be the perfect husband or wife. The Good News is, Christ has been perfect for you. In fact, He is bone of your bone and flesh of your flesh, born to save us by His death on the cross. To live a perfect life fulfilling all the vows we make and break. He is your Savior. Your Good Shepherd. Today He unites you as wedded husband and wife. He has you and holds you from this day forward, for better for worse, for richer for poorer, in sickness and in health. He loves and cherishes you by His Word and Water and Holy Communion. Not just until death do you part, but forever. And He pledges to you His faithfulness. He is the third cord that binds the two of you together. You see, it really is all about what you put into your marriage – or better yet – that Christ puts Himself into your marriage. He makes all the difference. Jesus weeps. Most people in the ancient world rejoiced to gaze upon the city of Jerusalem: the beauty of her gilded temple, the power and strength of kings and armies, the wealth of Solomon, the holy city, mount Zion – I was glad when they said to me let us go up to the house of the Lord. But this house of the Lord had become a den of robbers and knaves. So, Jesus weeps over Jerusalem. Like Jeremiah before Him, Jesus came to Jerusalem and received the same hospitality. Jerusalem, Jerusalem, the city that kills its prophets and stones those who are sent to it, how often I would have gathered your children as a hen gathers her chicks under her wings –but you would not." Jesus weeps. And the Chief Priests look for a way to destroy Him. Jesus Teaches. And the Scribes and Pharisees reject Him. The Son of God visits the Sons of Adam and He's nailed to a tree. The Stone that the builders rejected has become the Cornerstone. They did not know the day of His visitation. They would not know. They refused to know. It's horrifically ironic: The chief priests and their cohorts tried to accuse Jesus of some kind of crime, they sought to destroy Him. They could not stand His teaching. They knew it was true. He spoke with Authority. People were hanging on every word. No one could out argue Him. He didn't contradict Moses or the Prophets. He didn't fall for their traps and tricks. And they couldn't deny the miracles He performed. There was no failure of any kind in Him and yet they wanted Him dead. Why? Because He was holy and they weren't. Because He was Lord and they wanted to be. He upheld the Law they constantly failed to keep. They were guilty and too proud to admit it. Jesus' Word of Law as too true, it struck too deeply. So rather than facing the Law's punishment they plotted to destroy it; to destroy Him. Kill Jesus and they're free from the Law, or so they thought. And here's the irony it worked. They plotted and meant evil. But God meant it for good. While they schemed in hatred, God suffered in love. They did it to escape sin and its punishment; Jesus took on the cross to endure all sin and punishment, even of those who reject Him. Jerusalem may not have appeared this ugly from the hills walking into town, but outward appearances can be deceiving…and Jerusalem was queen of outward appearances, like a finely-dressed woman, every hair in place, adorned with sparkling jewelry, attractive and enchanting like the old witch turned temptress in Snow White. She was all dressed up like Jezebel, but full of liars and hypocrites and who despised God's Word. Dazzling beauty outside, ugly and rotten on the inside. They rejected God's gifts. Rejected His Son. Jerusalem was not destroyed because she broke the Law but because she broke the Gospel. Ooh, but she had it comin' didn't she?! Jesus wept but the dryness of her heart would not soften. Jesus cleansed the temple, but she just kept soiling her garments with lies, hypocrisy and rejection. Yes, when the Romans finally came in 70 A.D. with palisades and torches and battering rams and swords – she got what she had coming. But if it is true that Jerusalem reaped what she sowed, then why, haven't you as well? Jerusalem has nothing on you. For who among us is without guilt? Who among us has never filled our lips with lies? Who among us free of hypocrisy, always rejoicing and gladly hearing and learning God's Word? We are as guilty as Jerusalem. Why should we expect anything different? No, we are rebels, enemies of God, foolish, stubborn and stiff-necked, always resisting the Holy Spirit. The temple of our hearts is a den of thieves. And yet none of this would stop our Lord from visiting Jerusalem. For He goes down from the hills overlooking Jerusalem into the city of Peace to make peace between God and man – to end the war by offering His sacrifice on the cross in our place. As Jesus weeps in anguish over the city He's about to enter, He weeps not in wrath, but in love. He enters Jerusalem in order to die for all, even those who reject and sin against Him. Jerusalem's failures and rejection would not stop our Lord, and neither you're your sin. He would rather pry that sin from your cold dead fingers by His cross than see you carry your sin to your own destruction. He goes. He enters. He suffers. He dies. He visits His people. These are the things that make for peace: nails and thorns, scourging and spear. Blessed is He who is reviled and persecuted and uttered all kinds of evil against on our account, for great is the reward in heaven He gives to you. Blessed is the Peacemaker, for His is the Son of God. Peace in Human flesh, come to earth to visit us, to weep in anguish over our sin and to take turn our sin-hardened hearts into joyful, prayerful praising hearts. He enters Jerusalem for you – to reclaim you from the clutches of hell and the devil. He enters Jerusalem to cleanse the temple of your heart and drown your thieving, lying, hypocrisy-ridden old Adam in the water and blood that flows from His pierced side. This is Christ's blessed exchange: His life for your death. Your Sin for His Holiness. His heaven is given to you because your hell was His. He got all that you had comin' so that you receive all that He has to give you. For now in Christ Jesus we who were once filled with lies and hypocrisy, sin death and rebellion have now been brought near to God by the blood of Christ. For He Himself is our peace. He who wept over us in love also died on the cross for us in love, reconciling us to God. He went to Jerusalem to deliver you into His holiness. He cleansed the temple that He might replace it with Himself. Israel of old used to go to Jerusalem to receive God's holiness from the temple – God's presence. God's holiness distributed and dished up in blood, guts and sacrifices. The temple looked more like a slaughter house than sacred ground. But forgiveness is a bloody business. And so it was for Christ. These are the things that make for peace: nails and thorns, scourging and spears, blood and sacrifice. Life is in the blood. God's Peace is in that blood. God's holiness is in that righteous shed-for-you blood that drips, and pours and gushes from the cross to your chalice. These are the things that make for peace: You are baptized, washed in the holiness of His death and resurrection, a peace-drenching flood of forgiveness. You are absolved in the Name of Christ and live daily in His Peace. You hear and hang on His every Word for He brings peace through your ears to your hearts. He pours out His peace upon your tongue and lips as you receive the cup of salvation. Now is the time of your visitation. Now the Holy one of Israel comes to you. And Jesus weeps no more. For His cross is your peace. All your sin belongs to Him so that all his peace belongs to you. Jesus for you, not just in Jerusalem but here in Covina and wherever you receive His gifts that make for peace. Wherever God gives you His gifts there you have His Son. To have His Son is to have peace, to be reconciled, to be a citizen of the Jerusalem that will never perish or fade or be destroyed. For in Him and in His Church you are Holy. You are His. 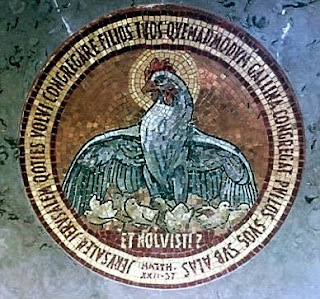 And whoever Christ touches and proclaims as holy – no matter how unlikely that is in the 1st or 21st century - is holy. The Peace of God which surpasses all understanding keep your hearts and minds in the true faith in Christ Jesus unto life everlasting + Amen.